So instead of doing a full on recap and due to my brief discussion/debate I had with some co-workers instead of voicing my thoughts or problems with the Grammy's I thought I'd have my good buddy Bob do the talking for me. For those that don't know who Bob is you can read about him here. I found out about this guy through a co-worker who always heard me rant about basically some of the things Bob talks about. This dude however is a lot more knowledgeable for the simple fact that he's been around industry people and actually studies it. Where I speak based on the little things I see and hear and try to make sense of it through a gut feeling. Yeah I said it. But anyways this dude makes really good points and I very seldom disagree. You can subscribe to his letter but be prepared to get a lot of emails. In addition I've added my favorite performances after the jump and the recap of who won. Enjoy! What kind of crazy fucked up world do we live in where the Golden Globes are simulcast, but the Grammys are on tape delay? All the action was online last night. Twitter was aflare. 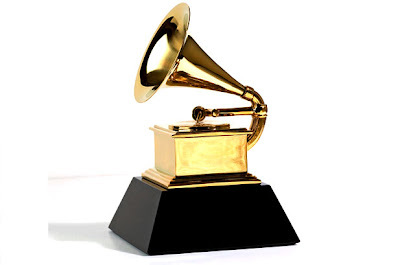 If you think the Grammy ratings spiked because of the show, you probably believe CDs are ripe for a comeback. The bottom line is we all like to participate. And the more mass the event, the more we're drawn to it. Used to be you could miss the Grammys, but now you'd be unable to discuss Nicki Minaj's train-wreck if you did. Yes, there are diehard fans tuning in to see their favorites, but most of us would rather sit in judgment of those doing their best to impress. You might think J. Lo and Tyler are the judges, but that's wrong. We are. Always have been, but now more than ever. The public is in control. Didn't we learn that with SOPA? The show was too boring to watch in real time. But playing with my lovers and haters on Twitter was incredibly entertaining. We were all on the other side of the glass, having a private conversation that those on screen were not clued into, to their detriment. I mean what kind of calamity was this, where seemingly half the acts lip-synched and it was a smorgasbord of genres. It was pure America, where everybody believes if they just work hard enough, they can become rich and famous and leave the rest of us behind. 1. Have a social media presence. Just like Twitter and Facebook drove up the Grammy ratings to 1984 levels, their second best ever, interacting where your fans are will enhance your career. 2. Ignore the haters. They come with the territory. If you're too afraid to be beaten up online, close your account, don't play, go to your psychiatrist and cry. Behind a cloak of anonymity, without knowing the people they're tearing down, the hoi polloi is vicious. If you take it personally, you've missed the point. See it as jealousy. The want what you've got, even if you don't think what you possess is so damn hot. They're angry where they're at and you're the scapegoat. Laugh about it. 3. Make it easy. If the Grammys had been simulcast throughout the U.S. the ratings would have been even higher. I felt left out during the east coast feed. My e-mail was aflutter, Tweetdeck was raging, and I couldn't play. Furthermore, the whole damn world's a spoiler alert. We live online. If you think people can avoid the results, you live in a vacuum. 4. Don't put money first. That's why CBS insisted on tape delay. Believing only during prime time could they charge premium prices for advertising. It's all about the franchise. Build it and they will come. Do you think advertisers complain that the Super Bowl is aired in the afternoon on the west coast and they want a discount? Of course not! They know everybody's tuned in. 5. There are a limited number of franchises. There's only one Grammys and one Oscars. Forget about competition, build it and buff it and they will come. The Grammys should add another event. Maybe a nomination special wherein what the public votes for gets a chance at winning a Grammy. Instead of being beholden to CBS, the Grammys should pull the ancient TV network into the future. Music leads online, don't expect a TV network worried about theft of its content to get it. The more viewers you've got, the more money you've got. 6. All publicity is not good publicity. That guy in Foster The People looked like a dork and sang even worse, I felt positively towards the act before, now I can see their talent is limited. As for Adam Levine... If you can't sing, stay off the stage. 7. Fight for your right to do it your way. The Civil Wars got a minute, but doing their own song acoustically paid more dividends than those garnered by anybody playing by the rules, agreeing to do a medley with an act they had little in common with, if anything at all. 8. Less is more. Who made a bigger impression last night, Adele or Nicki Minaj? Who sold more records? It's about music. It goes in the ears, not the eyes. The old paradigm is gone. History. Public policy may still be driven by corporations, but entertainment is owned by the public. If you think you're above the audience, you're cruisin' for a bruisin'. I had a great time watching the Grammys last night. But it wasn't the show. But the behind the scenes conversation. Not with some dressed up airhead interviewing celebs spouting vapidities, but with the vast unwashed online. Some hating, some loving, some with perceptive insight and all spreading the word, retweeting thoughts to the farthest reaches of the Internet, to the point where no one was unaware of what was happening at the Grammys.